Some people prefer playing air hockey for hours on end. Others are partial to the pool table. When you, your family, and your friends are fans of one or the other both, you can’t just buy an air hockey table or a pool table to satisfy everyone. But you can make everyone happy when you get the best air hockey pool table combos. 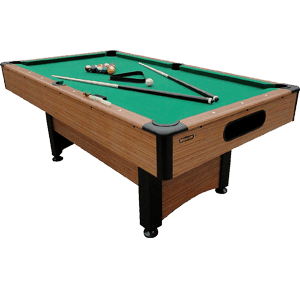 Other then pool table air hockey combo or pool table and air hockey combo you can find.Because all are similar as well entertaining.With this table, fans of either game will be accommodated. What’s more, people won’t have to get tired of playing the same game over and over again. Another plus here is that it saves money and space to get two games with just one gaming table purchase.Finding the best combo table can be confusing with lots of options available, but 2 brands do stand out. 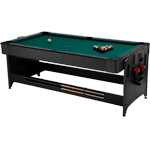 The Fat Cat Pockey game tables and the Triumph Sports tables from Escalade Sports are especially terrific, and will offer great value for your money. So which is the best air hockey pool table combos for you? This depends on your budget, although of course that’s hardly the only factor you should consider. Here are some excellent options that may suit your needs. 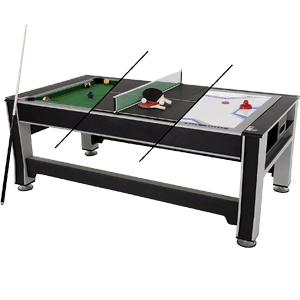 This model exemplifies nicely how the air hockey and pool table combo can work seamlessly. At first it can be a billiards table, and then you can flip it over and you have a table for air hockey. The substantial dimensions work well for teens and adults. It measures 80 inches long and 44 inches wide, and most people find the 32-inch height just right. For billiards, you need to make sure you have ample room so that players can move around and make shots freely even if the ball is on the side of the cushions.The quality of the billiard table is quite okay. The playing surface is Teflon green felt cloth. The bumpers are made of rubber, and the drop pockets lead to an accessible socket where you can get the dropped balls. There are then ledges for the ball so you can keep score and for storage. Play is good, and the bounce angles are just right. The accessories are complete, with a pair of 57-inch single-piece cues, a resin triangle to set the balls, a couple of pieces of chalk, and a brush to clean the playing surface. The balls measure 2.25 inches.Now by itself this can already lend to lots of hours of gaming for teens on weekends and holiday breaks. The fact that you can turn it over so people can play air hockey is a real bonus. What’s really satisfying is that Fat Cat didn’t just offer a slippery playing surface for the hockey game. It really is air hockey, as it also features a powerful blower to pump in air for the playing surface. Again you have the requisite accessories, with 4 paddles and 4 pucks. Here you have a latch system for all these accessories as well. This 2 in 1 air hockey and pool table or Pockey table power plug is 16 feet long, and it’s designed to efficiently enable the flipping of the tableIt’s not complicated to put together despite the inherent problems of assembling a combo table. You may need 2 people since the pieces are heavy, and it will only take a couple of hours.Once you’re done, you have a combo table that works and it will last for a very long while. Some customers report that they’ve had this for more than 6 years and it still works perfectly. Yes,again you can make everyone happy when you get the best air hockey pool table combos you can find. Just because 2-in-1 gaming tables work perfectly doesn’t mean that 3-in models will be just as good. But this fat cat 3-in-1 combination game table or 3-in-1 Pockey combo game table illustrates how fine quality can lead to a product that works smoothly. That’s because you’re adding an extra layer of complexity, so more things can go wrong. 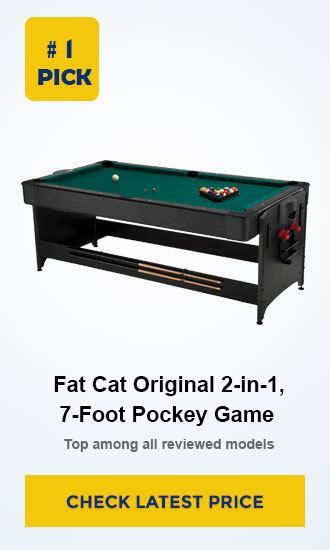 It works because it’s basically the 2-in-1 Fat Cat Original model, and you simply turn the table over to get either a billiards table or air hockey. All the accessories and features of these games are the same as in the 2-in-1 mode. It still measures 80 by 44 by 32 inches. What’s different is the addition of the ping pong (table tennis) table. It covers the billiard table surface entirely, so it’s not as large as standard ping pong tables. But for teens, it’s just right. It’s the right size to get kids interested in table tennis without spending (and risking) too much money on a standard table. You also won’t have to need a larger space for player to maneuver in. The table tennis surface is separate, but that doesn’t mean that it needs a lot of storage space. That’s because it folds into 3 sections. Setting it up is no big deal, and you have the net and the 2 paddles and 2 ping pong balls. 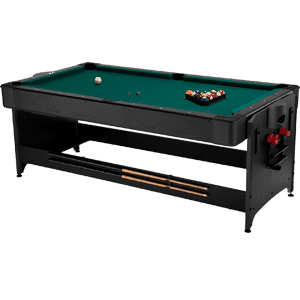 This air hockey pool table is truly great for kids who hang out, and parties are more festive with this table available. You can switch from one game to another without too much difficulty, and you don’t need too much space so you can fit in 3 different tables. While it only allows for 2 players each time, others can always enjoy themselves just watching the games and taking turns challenging the winner.That is why the best air hockey pool table combos for you. This Triumph Sports 84-Inch combo gaming table is a more affordable version of the 3-in-1 combo from Escalade Sports. It means that its playing quality isn’t quite as good as the Fat Cat (quality is generally more expensive for these things), but it’s still a good product nonetheless. ​It operates with the same design principles. You can flip the table over and play either air hockey or billiards. Or you can put a table tennis set on top and play ping pong. All the accessories you need are part of the package. Its total dimensions are 84 by 44.5 by 32 inches. With the billiards table, the playing surface is 66 inches long and 36.25 inches wide. With the high density green nylon blend, the rolling and bounce of the balls are consistent and very even once you make sure you have a level surface. Fortunately, here you get leg levelers that should help in getting an even playing surface. You also get a pair of 57-inch cue sticks, 2 pieces of chalk, a triangle, and a table brush. With the air hockey table, the playing surface measures 68.5 by 38.5 inches. You also get a nice air blower too, along 2 pushers and 2 pucks. For the ping pong table, you get 2 ping balls, 2 paddles, and a net and post set. The biggest risk here is getting the item with some damaged parts. The delivery can be a hassle too. But if everything comes in undamaged, the assembly is straightforward and there’s lots of fun to be had when switching games. 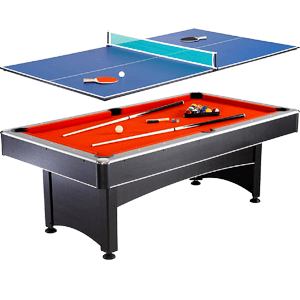 Yes, with this best air hockey ping pong table combo again you can make everyone happy when you get the best air hockey pool table combos you can find like triumph sports 84 inch 3 in 1. Now what if 3 games aren’t enough? 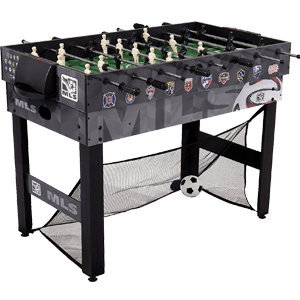 With the Triumph Sports table, you can actually get another game so you have 4 games total. The additional game is another classic, as it is table soccer. This is perfect for kids, as it offers options for different tastes and preferences and they won’t get bored with just a single game. So the dimensions are a bit smaller, as it measures 72 inches long and 32 inches wide. ​But the height remains at 32 inches high so adults can play it comfortably as well.With so much options, kids can get started on playing 4 different games altogether. The quality of each game is quite nice. As well it is best air hockey pool table combos no doubt. The billiard table offers smooth rolls and nice bounces along with 48-inch cue sticks, the air hockey game comes with an air blower, the table tennis folds in 3 sections, and the tale soccer can be engrossing. Since this is for kids, the price is very low. 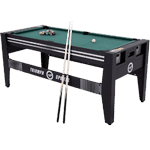 It’s even less than half the cost of the Triumph Sports 84-Inch 3-in-1 combo table. With kids these days, sometimes even ​​dubble classic games aren’t enough. You can make sure that a large group of kids will have a nice selection of games with this combo table, as it offers four games! The space savings are substantial (not to mention the savings on expenses) since this table is only 48 inches long. ​That means it’s also much easier to move from one spot to another. The games include foosball, hockey, billiards, table tennis, bowling, and shuffle board. You also get classic board games like chess, checkers, and even backgammon. You get all the accessories for each game and switching from one game to another isn’t a problem. You just remove the current tabletop and put on a new one. Are you preparing for professional tournaments? If so, you need a table that is durable, complicated, and comprehensive in design and makeup. This indeed is that particular table. It is designed for those fast-paced and intense exercises. It has rubber cushions round about the perimeter of its play-bed. These offer excellent rebound for you. They also enhance the speed and accuracy of the shots altogether. By opting for this table, you will be sure to sharpen your skills considerably. The Rail integrated pockets lead your balls to the ends of the table. It is further supplemented with a ball return system which makes it easier for you to reset for a new game quickly and easily. This is basically a green nylon cloth. It is durable and will hence last through years and years of aggressive family plays. This green cloth also gives the table a classic and billiard look. You hence stand to enjoy added aesthetics as well. The table’s disc-style leg levelers allow you to alter the heights of each corner of the table appropriately. They in so doing enable a perfectly level playing surface. This is even when the floor is sloppy. Lastly, the table contains a stylish bamboo laminate exterior. This compliments all kinds of interior décor. Moreover, its 5.5-inch rails provide solid resistance to provide you with consistent rebounds. This will result in greater scores and maximum enjoyment of the game. Is your search for a suitable table dictated by the need for regular practice, everyday use, and long-term applicability? If so, this durable, tough, and reliable table could be the companion you have been searching for every quite often. Its playing surface is covered using the high quality and blended felt material. This provides a smooth and breathtaking surface. The cloth is also resistant to tears and frays. This means you will spend less to maintain it in the long run. All of the table’s wooden and metallic components are cushioned using the K66 rubber cushions. These are designed to prevent you from sustaining injuries besides conferring added comfort. You will be certain to enjoy your games as the result of this. Sharp corners will usually predispose players to the risks of injuries. Luckily, this table’s sharp corners are sealed against such possibilities. This is because they are covered and sealed by use of chrome plates. You can be sure of your safety. The table’s top rails are laminated using silver. This material is not only breathtaking but also durable. This is because it resists rust and cleavages well. This material thus extends the overall lifespan of the said parts. 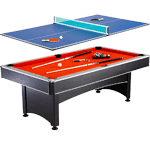 Its playing surface comes in the form of the high quality and engineered wooden table tennis top. This material is hard, stable, and depreciates slowly. This being the case, you will experience maximum and timely rebounds beside higher scores. This is also use a air hockey pool table topper. 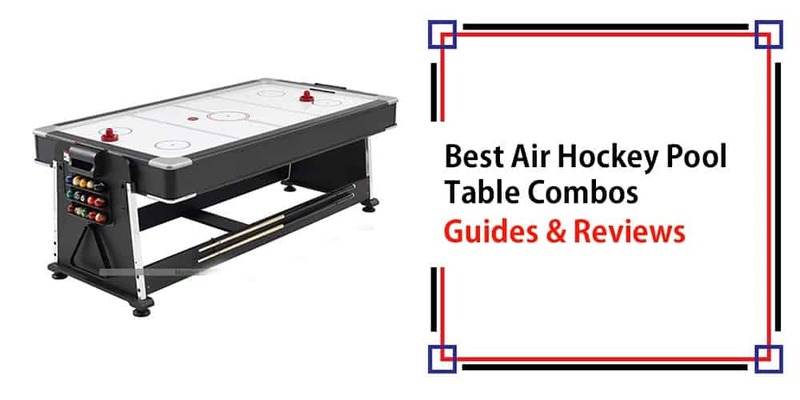 ​​​​​Finally above are pool table air hockey combo or tabletop pool table and air hockey table combination is great.Because it’s always nice to have options when you’re playing these games with best air hockey pool table and air hockey combo. You make sure you and you don’t get tired of playing just one game, and at the same time you save a lot on expenses and in space. Moreover this is also combo ping pong pool table and air hockey table combo or pool table air hockey combo reviews or air hockey pool table combo reviews make a great entertaining for you and your family.Also this guide and reviews cover the name of search-kids pool table combo, pool table combinations, pool and air hockey tables combo, pool tables air hockey combos, pool table combos, air hockey table pool table combo.So above all are also best air hockey table as well as ping pong pool table combo reviews no doubt. The best air hockey pool table combos or best pool table air hockey combo or best combo game table will depend on your budget and how old the players are, but in general all these games will have kids of all ages (including the adults) clamoring to play when they have free time.More over, Also you can enjoy a lucrative game with bubble hockey table game-its gives you highest level satisfaction.